New mobile fingerprinting technology will allow frontline officers across the country to use their smartphones to identify people in less than a minute – saving police time and reducing costs. 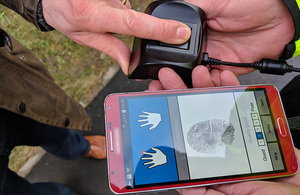 An app on an officer’s phone, combined with a handheld scanner, will mean police will be able to check fingerprints against both criminal and immigration records by connecting to the two live databases (IDENT1 and IABS) via the new Biometric Services Gateway. “The Biometric Services Gateway is just one of a series of national systems the Home Office is designing with policing to give officers information at their fingertips faster than ever before”. “By cutting out unnecessary trips to and from the police station, mobile technology is really helping to save valuable time and allowing officers to do what they do best – cutting crime and keeping us safe”. “It’s clear that by embracing technology the police can improve efficiency and, if all forces delivered the level of productivity from mobile working as the leading forces, the average officer could spend an hour a day extra on the frontline”. The Biometric Services Gateway, enabled by Home Office technology, will also lead to significant costs savings, with the new system available at a fraction of the cost of those currently in use. The scanners used by WYP cost less than £300 – 10% of the cost of current mobile fingerprint systems. As well as identifying a person of interest who may be withholding their name, the technology enables officers to rapidly identify someone experiencing a medical emergency and make contact with their next of kin. Early examples of the new system in action include a firearms unit, who detained a driver after a short pursuit and were able to identify him as a disqualified driver, despite him giving false details. He was issued with a summons for three offences and his vehicle seized. The armed response unit returned to patrol within ten minutes, and without the mobile fingerprint scanner this could have resulted in the unit being out of action for four hours taking the individual to a custody suite. “The introduction of these fingerprint devices is a significant step forward for West Yorkshire Police and marks another milestone in our technological ambitions”. “As we have already experienced in the trial, the combination of these digital solutions bring tangible benefits to policing our communities”. “It means we can submit fingerprints of suspects from the street to a live time national database and receive results in less than a minute”. “We have seen first-hand, for instance, how this rapid identification has enabled speedy and accurate medical treatment based on the records available. Its use also allows relatives to attend hospital to see their loved ones when time is of the essence”. “From an operational perspective, they quickly open investigative leads into serious crimes and can often reveal the associates of an otherwise unknown victim”. “Likewise, they can immediately identify suspects who attempt to give false details and will prompt people to be more forthcoming in the first place”. “The added benefit is that they provide greater value for money, which means we can increase their usage across the organisation”. “The introduction of the Biometrics Services Gateway shows how West Yorkshire Police is once again leading the way with new technology and builds on the investment and introduction of the handheld mobiles that all frontline officers use”. “Using this advanced technology means officers are out on the street providing that visible presence rather than dealing with suspects in custody and could eventually enable the introduction of new automated systems, further ensuring officers are freed up to provide reassurance in our communities”. “It is important that we continually improve our services to make sure the needs of our communities are at the heart of delivery. Investing in this cutting edge technology forms a crucial part of that picture, ensuring the public of West Yorkshire are safer and feel safer, but crucially testing this proof of concept so that the overall benefits can be rolled out across policing nationally for everyone’s benefit”. This entry was posted in Biometric Technology and tagged Biometric, Biometric services gateway, Mobile Fingerprinting Technology, West Yorkshire Police, WYP on February 12, 2018 by Tim Cosgrove.